In some states in walleye country, the walleye ice-fishing season is winding down. Some places protect walleyes as they enter the time of the year when they’re preparing to spawn. 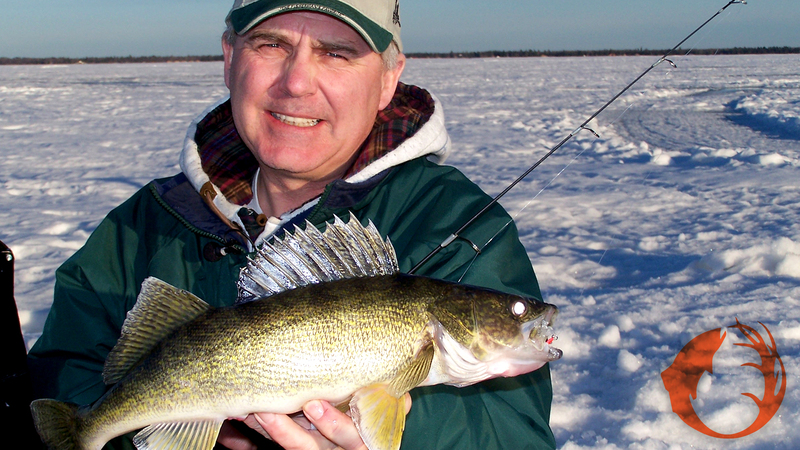 In the areas where catching and keeping walleyes is permitted though, we are entering a time of year when walleye fishing through the ice can be very good. Here’s how you can get in on the action. There are times of the day that are better. Early and late in the day can be more productive, but fishing can also get good when a weather change starts. With all that said, and all else being equal, I like late afternoon and early evening best. And, as most knowledgeable ice-anglers will suggest, keep an eye on your sonar and do what it tells you to do. It’s important to know that there are fish in the area, but it’s also very important to know how the fish are responding to your lure. Lure selection and presentation can be critical. If you see fish looking at your lure but not eating it, you need to make some changes. I’ve been using a Vexilar FLX28 the past couple of years. I don’t know how anyone can make a better sonar. It truly will help you catch more fish from under the ice. Sometimes the walleyes want a lure worked aggressively, sometimes they prefer a more subtle presentation. This is when you really need to pay attention to what you’re doing. Let’s say you’re working the lure very aggressively, snapping it up and down quickly. You see several fish come in and look, but they don’t eat. Try working the lure slower. Don’t change to another lure or another color or another size, just slow down. Show the fish a slower presentation. If they keep looking but not eating, then go ahead and change lure size or color. It’s also important that you know the fish are seeing the lure. The bottom of the lake is just like the ground that we walk on: There are high and low points. It could be that there is a rise in the lake bottom between your bait and the fish. The walleye is just a few feet away from your bait but can’t see it because there’s something in between the fish and the lure. Be sure to lift your bait a couple feet off the bottom every now and then to increase the odds of the fish seeing your lure. Later in the ice season, the walleyes have seen it all. Try showing them something they haven’t seen for awhile. When the fish are really selective, go to a Stand-up Fire-Ball jig. Drop the jig to the bottom and let it rest there. We’re using the stand-up Fire-Ball because, due to its design, the minnow stands up off the bottom. Bounce it up and down on the bottom a few times, then let it sit still. The jig bouncing off the bottom will create a small dust cloud and will attract the walleyes. When they come over to see what’s going on, they’ll see that minnow wiggling and will hopefully eat it. Late season is a great time to be on the ice. If you can get out, and if walleye season is still open where you live, take advantage of it. If walleye season isn’t still open, you should consider traveling somewhere where it is open. The action can be good enough to justify a little extra effort to get in on it. Photo: This walleye took a liking to John Peterson’s Buck-Shot Rattle Spoon.